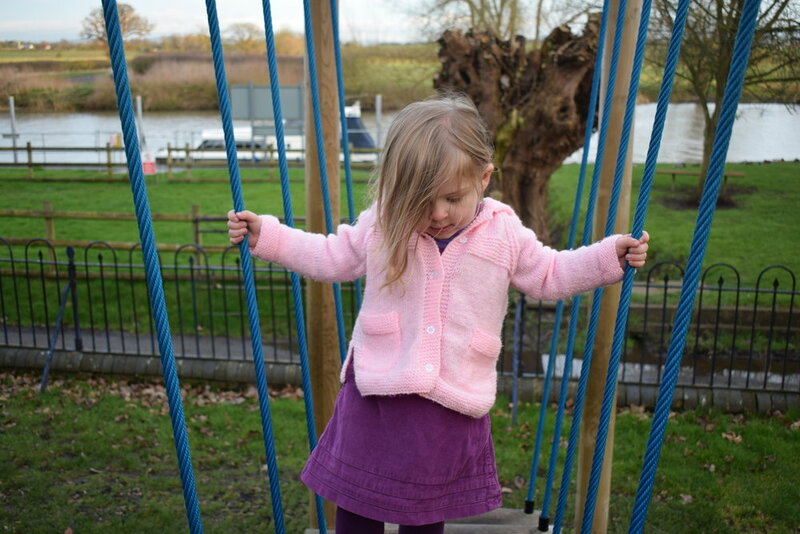 This week we've spent a few days with my sister-in-law and her family, and that has meant that we have had two full of energy almost-three year olds to entertain. This has been, in a word, difficult. Especially as, just like most toddlers, both girls get bored of one activity rather quickly and want to move on to another. The moment we arrived, the girls immediately started jumping about the place and shouting in excitement. It didn't matter that it was bed time. As we watched the girls bounce around, laughing and being very loud, we decided that it was essential to find some way to entertain our girls, that would release their excess energy and get them calm in time for bed time in the days to come; especially as it is John's week off on holiday and that means we want to rest as much as possible! Doing things together, and making sure that they were able to do the same things seems to be one top tip for success in keeping our girls from driving us completely crazy. I'm glad we did, as we had to start our days early, due to both girls not seeming to understand what a lie in is! Thankfully though, from the moment the girls were awake we managed to find ways to tire them out. One activity we used to have fun and keep them occupied, (although it certainly wasn't a quiet one...) was their matching scooters. These were a massive hit, and they loved racing up and down the centre of the restaurant. These races wore them out too! They were so cute together; and I loved watching them pause for thwir scrambled egg breakfast and glasses of water. This break was short lived though, and soon after we had to find a new pastime for our two toddlers. Luckily, the children in our family love to be outdoors. This is great, as I believe there is nothing better than having them out in the fresh air. On site at my sister-in-law's inn is a cute little playground, which was a great way to allow my daughter and niece to run off some of their excess energy. We spent as much time as possible out there, and they loved it. In spite of trying to keep the girls outside as much as possible, sometimes, especially when it has been too cold and windy (like it is today since Storm Doris that's arrived) we have had to stay indoors. Keeping two crazy, hyperactive bundles-of-fun toddlers busy can be no mean feat when you don't want them to wreck the joint by doing things like putting all the toys on the floor! Luckily my sister-in-law and I are dab hands at keeping our girls from getting bored, and between us we found plenty of ways to keep the girls from making too much mess or getting too bored. They are both so full of life and excitement, that every activity is something to be enjoyed and scream happily about. From simple things like reading books to more adventurous activities such as crafty things; there is never a dull moment with our girls. As we're heading towards Easter, my sister-in-law had bought a selection of items from Poundland and a couple of Easter bonnets. As soon as the items were out of the bags, the girls were making a jolly mess; but having loads of fun, choosing how to decorate their hats. The sticking down of feathers, eggs, chicks and sheep was a great form of entertainment for the girls. Funnily enough, we didn't even have to get out the messy crafty stuff for them to have lots of fun. 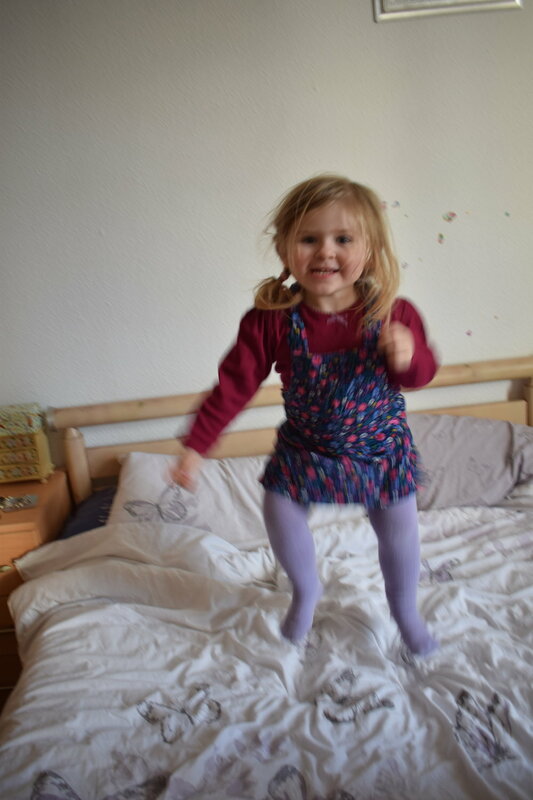 It turns out that something as simple as jumping on the bed was just as exciting as any other planned activity. The giggles and squeals from the girls were a pleasure to hear; even if they did get a bit loud and over excited! I was glad of a break from having to keep an eye on them sometimes though. This was true even if it was five minutes while the girls pretended to have a nap; top and tail on the mattress my daughter had been using as a bed during our stay. I could tell the peace and quiet wouldn't last long though, as the girls giggled under the covers. Whatever activities we did together, there was always smiles and joy. The girls are the best of friends, and it doesn't seem to matter to them that there can be a couple of months in between our get togethers. Sadly, our time together has come to an end, and so our entertainment strategy is no longer for two, but one. We have a two hour car journey to my parents-in-law's home coming up, and so we need to find a way to entertain our daughter until we arrive there. Since just before her second birthday, our toddler has barely slept in the car, no matter how long the journey! For some reason, she decided that sleep is for the weak. This means that a two hour car journey for her feels like a life time. We have invested in some crayons, paper and a DVD player with her favourite programme, Paw Patrol; and that means that hopefully she'll be quiet and happy until the excitement of seeing her grandparents takes over! Rattan Direct make fabulous furniture, which can be found on their website here. They have put together a survey to find out how parents keep their children entertained, which we'd love for you to fill out. Click this link to fill out the survey. Disclaimer: This post is a sponsored post published in collaboration with the team at Rattan Direct for their child entertainment survey.